Move to help development teams "fulfil their maximum potential". 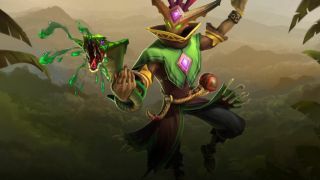 Hi-Rez Studios has announced that it is establishing three new, separate developers. The company, known for its free-to-play multiplayer games such as Paladins and Smite, is dividing its resources into a trio of new studios that will be overseen by a general manager. The three new studios are Titan Forge Games, Evil Mojo Games, and Heroic Leap Games. Each of these will be responsible for handling one of the company’s ongoing projects. Titan Forge Games will man the helm of Hi-Rez' MOBA Smite. Evil Mojo games will oversee the Overwatch-like shooter Paladins, while Heroic Leap games will develop Realm Royale, its Battle Royale spinoff originally known as Paladins: Battlegrounds. Chris Larson, formerly the executive producer of Smite and Paladins, will act as general manager for first party studios, overseeing the three teams. Hi-Rez’s support for Paladins, Smite, and Realm Royale has been pretty consistent. “By structuring ourselves in this manner, we allow the organization to scale to multiple games more easily, while ensuring our existing game communities receive a better, more focused service than ever before."